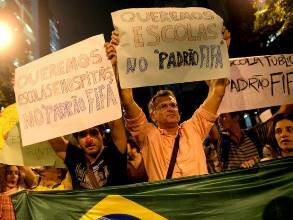 Brazilian Evangelicals: Stepping out into the Streets? There is growing evidence of a potential shift in how Evangelicals engage in social issues in Brazil. I witnessed their traditional approach recently inside a prison in one of Rio de Janeiro’s gritty peripheral suburbs. Twelve men stood with their eyes closed and their arms draped around each other’s shoulders while an Evangelical pastor led the group in prayer. After the final “amèm,” an inmate leader embraced the pastor and thanked him for his visit, to which the pastor responded, “I know that if I am ever in here in the future, you would come to visit me too.” The pastor’s presence in the cellblock and his subtle pledge of solidarity with the inmates is typical of how Evangelicals have confronted pressing social problems through direct intervention and meeting the immediate needs of individuals in distress. They have been more likely to try to change the prison system by visiting inmates than by voting for a particular candidate or pushing for prison-specific legislation. Theirs is a politics of presence. But recently there have been signs that Brazilian Evangelicals’ intentional proximity to the needy is pushing some towards a different and more public strategy: street protest. Even without an explicit political agenda, Brazilian Evangelicals have proven their ability to mobilize. In early July, an estimated 2 million Evangelicals participated in the “March for Jesus” in the streets of São Paulo. They sang hymns and prayed for the future of their country, but they did not use their collective voice to make demands of the government. In contrast, just two weeks earlier, 65,000 people captured the global media’s attention by marching through the same avenues in São Paulo to protest increased public transportation fares, government corruption, and the fortune being spent on soccer stadiums for the 2014 World Cup. The street protests gained momentum over the summer, but many Evangelical pastors and leaders were hesitant to offer public support, preferring to continue a strategy that relies on their direct service to the poor, the oppressed, and the imprisoned in their communities. Evangelical support of the street protests in Brazil has been minimal, but not completely absent. Some Evangelicals appear eager to move beyond a “politics of presence” approach and address the social structures and institutions they blame for many of Brazil’s social problems. In Rio de Janeiro, the human rights NGO Rio de Paz – one of the most visible and vocal groups in the recent protests – is led by an Evangelical pastor, and the bulk of the volunteers are Evangelicals. One such volunteer, a son of a Pentecostal pastor, joined the masses demanding governmental reform and, to encourage others from his church to follow his lead, posted Proverbs 29:4 to his Facebook page: “By justice a king gives a country stability, but those who are greedy for bribes tear it down.” He closed his appeal by writing that “in 30 years I want to tell my children that they live in a more dignified country because their parents didn’t sit at home waiting for a change.” If that message resonates widely among Brazil’s 40 million Evangelicals, the Brazilian government will confront ever greater pressure from the streets to carry out long overdue reforms of corrupt institutions and practices. Andrew Johnson is a Research Associate at the Center for Religion and Civic Culture at the University of Southern California and a contributor to a two-year project on Religious Responses to Violence in Latin America carried out by the AU Center for Latin American & Latino Studies with support from the Henry R. Luce Initiative on Religion and International Affairs. Thanks for sharing this! It’s great to read about how Evangelicals in Brazil are changing lives by inviting people into a relationship with Jesus, and being His hands and feet to those in need. They’re not only living out the “politics of presence,” they’re working to bring about change for a better future in Brazil.